No preparation required. Wax on the run! With the fragility of a balloon, delicate and sensitive skin requires extra special care. 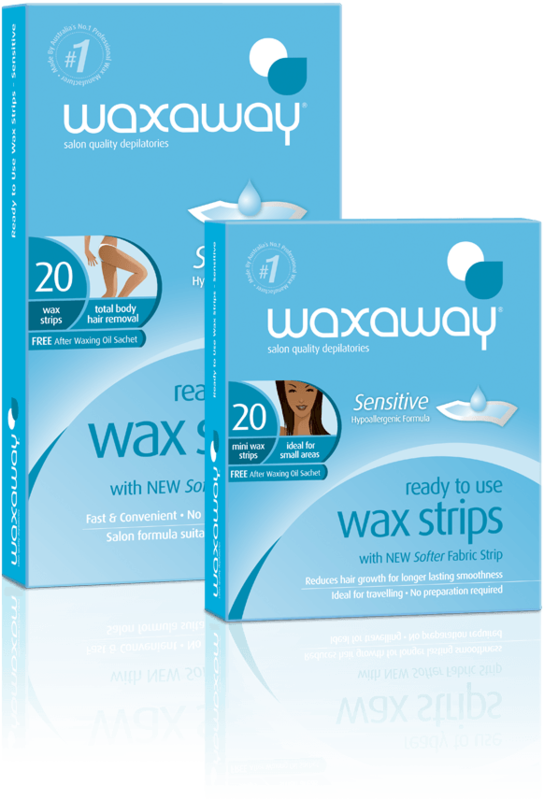 That’s why Waxaway Ready To Use Wax Strips Sensitive are made with a Hypoallergenic Salon Formula which is applied to a softer fabric strip that gently removes unwanted hair in a matter of minutes without mess or fuss. Compact and convenient, they are available in 2 sizes for the face and the body and can be used up to 5 times with results lasting up to 4 weeks. Briskly rub strips between palms to warm wax. Slowly separate a double Waxaway Ready to Use Strip into two strips. Using the palm of your hands and fingertips, apply strip with firm pressure and firmly smooth over 3-4 times in direction of hair growth. Holding skin taut with one hand, quickly pull strip off in the opposite direction of hair growth. Remember to hold skin taut with the other hand and to pull close to the skin rather than up into the air. For a salon perfect finish remove any residue with After Waxing Oil.